Canned fruits, vegetables, proteins, and soups can help you get through the week with creative meals you can feel good about serving your family like Panzanella Salad and Slow Cooker Coconut Curry Chili. In addition, according to a study published in “Nutrients,” kids and adults who use six or more canned foods per week are more likely to have diets higher in 17 essential nutrients, including potassium, calcium, and fiber. To make dressing: In a small bowl, stir together olive oil, white wine vinegar, salt and pepper. Set aside. 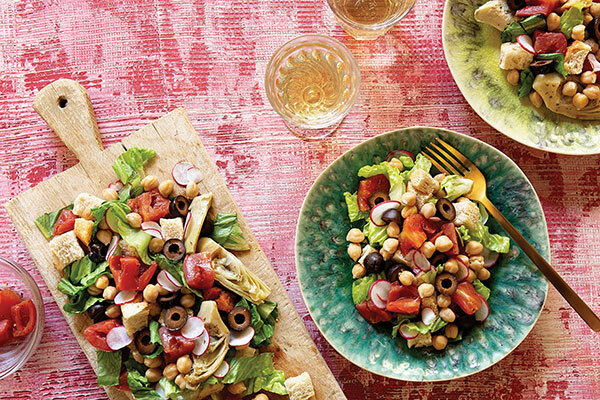 To assemble salad: In a large bowl, toss bread cubes, lettuce, tomato wedges, beans, artichoke hearts, olives and radishes; drizzle with dressing.